Cup captures the flavor of freshly sliced pineapple amazingly. Think of sitting on a sunny veranda with a nice cup of tea. Great over ice. Cup Characteristics: Cup captures the flavor of freshly sliced pineapple amazingly. Think of sitting on a sunny veranda with a nice cup of tea. Great over ice. Luxury Ingredients: Black tea, Pineapple pieces, Blackberry & Lime leaves, Calendula & Sunflower petals, and Natural flavors. The Pineapple is native to southern Brazil and Paraguay. It was first discovered by a European in November, 1493, by Christopher Columbus, (is there anything he didn’t discover?!) He brought some back to Europe with him and the rest, as they say, is history. The Pineapple came to be so coveted by European nobility for its sweet flavor and grand appearance that King Charles II of England once posed for an official portrait receiving one as a gift. Pineapples were a big hit in colonial America as well – but early Americans appeared to prize the fruit more for its appearance than its taste. In some cases merchants even rented them by the day to Southern matrons who would use them to decorate their tables – pineapples being highly regarded as important symbols of hospitality. 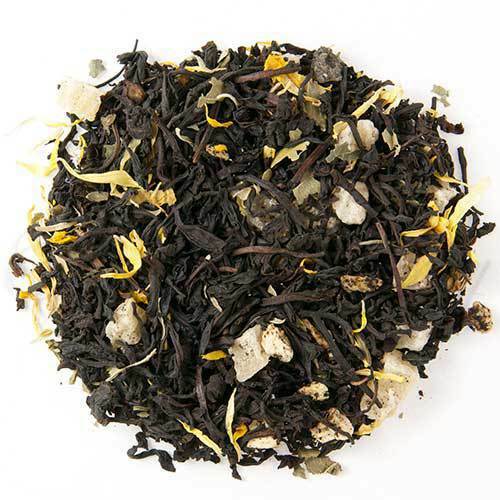 Serve this fabulous tea to guests and carry on the tradition. A dash of sugar helps to bring out the natural sweetness of the fruit. Serve over ice for a real Southern treat!